Consig, the Consulting club of SJMSoM organized the Consulting Induction Program for the batch of 2016. This session was organized in collaboration with ZENeSYS Learning, a leading firm in consulting talent development. 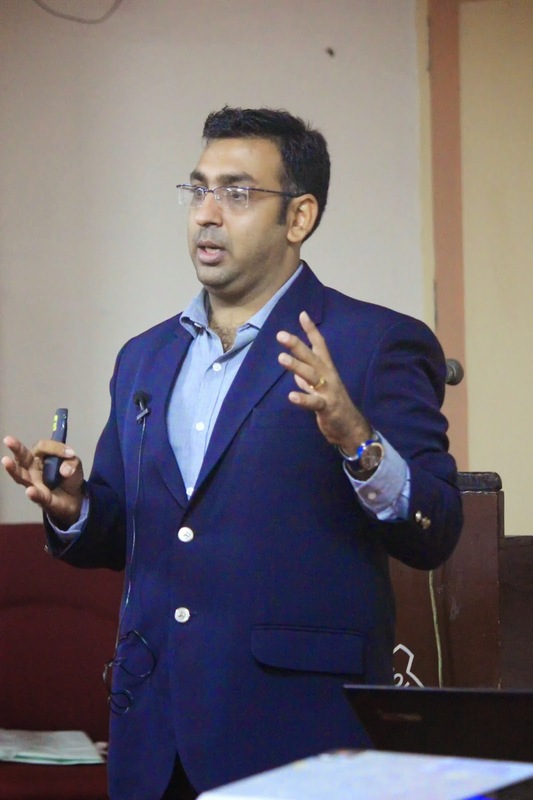 Mr. Karan Ahuja, AVP ZENeSYS, was amongst us to demystify the concepts of Consulting and to provide us with a road-map for a successful career in the same. He comes with a diverse experience in Consulting, having worked with PwC, Booz & Co, Reliance, etc. Consulting is a very challenging job, where a consultant has to prove his credibility and meet the expectations of his clients on a day-to-day basis. A consultant is expected to be good at data analysis and problem solving. He should be the “Jack of all trades” and “master of none”, as he would be working in multitude of domains for which the specific knowledge could be gathered from the domain experts. His job is to study the “Best Practices” from whichever industry, and implement them for his customer. Mr. Ahuja was candid in explaining some of the negative perception pertaining to consulting. Critics argue that consultants are expensive, generalists, who lack specific knowledge and responsibility and more often than not, provide infeasible solutions. Consultants, however, view themselves as smartest people around who are free from internal interference. One of the most important qualities of consultants is that they don’t pass the buck in moments of crisis. A consultant always keeps in mind the opinion of his clients, as they themselves have a breadth of experience in their fields. Mr. Ahuja then moved on to explain the various types of consulting. Firstly he explained the difference between Strategy consulting and operational consulting. Strategy consulting involves more of providing solutions with respect to future planning such as new product line, mergers and acquisitions, new businesses etc. Operational consulting on the other hand involves solving existing business problems such as reducing operational/manufacturing costs and time, improving profitability etc. He then went on to discuss IT consulting by giving crisp definition of the same. IT consulting means solving business problems using technology. There is a substantial demand for IT consultants in the market today. He also provided a brief insight into boutique consulting option such as sports consulting. Further into the session, Mr. Ahuja explained the pros and cons of choosing consulting as a career. The life of a consultant is exciting. He gets to work in various domains and places. He is paid handsomely and is entitled to a lavish lifestyle. But, at the same time, he is also expected to work for extended hours and deliver every time. There is a lack of stability as he is always on the move. Mr. Ahuja also explained the general career path followed by a consultant. A consultant, in the beginning of his career, is involved in a lot of market research, data compilation and power point presentations. As the time passes and he gains experience by working with and looking at his seniors, and gradually, he grows into a real consultant, capable of understanding and analyzing data, connecting the dots and finally coming up with solutions. He then moves into management roles where he handles different projects and deliveries. He finally explained what role Zenesys could play in developing one’s consulting career. Zenesys consulting competency certification (ZC3), an integrated learning and training based accreditation program is one of their top offerings. It involves select students from leading business schools in live projects. There are multiple online learning modules as well as mentoring by experienced consultants. The session was very engaging and informative for everyone present. The audience got a clear picture of what consulting is all about. Some of them expressed their keen interest in consulting with clarity of which particular role as a consultant to pursue, post the session. Mr. Ahuja responded to all of the queries from the audience with zeal. The session ended with its purpose fulfilled. The Class of 2016 was more informed about consulting than they were, two hours earlier. Thank you for your interest to share this information. Consulting club of SJMSoM organized the Consulting Induction Program for the batch of 2016.If you want essay related topic you can go for custom essay writing service will get better result.